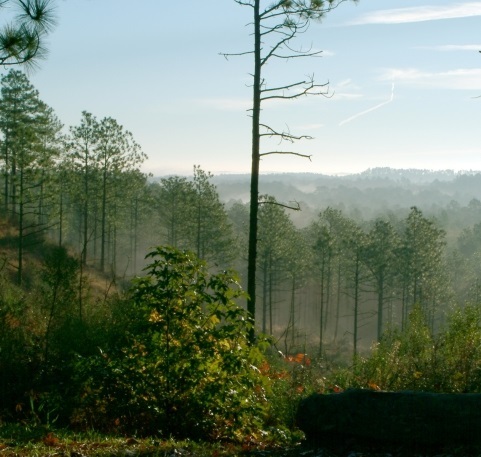 The sandstone bluffs of the Longleaf Vista Area of the Kisatchie National Forest is known locally as the “Little Grand Canyon.” Photo by U.S. Forest Service. A warmer climate may lead to higher growth and productivity on U.S. national forests and grasslands, but university and U.S. Forest Service researchers say this could reduce quantities of fresh water flowing from most of these lands, even with increases in precipitation. Results were published today in Scientific Reports. “The national forests and grasslands managed by the U.S. Forest Service represent only 9 percent of the U.S. land area, but play an important role in providing fresh water that contributes to about 14 percent of the national water supply,” says Kai Duan, a North Carolina State University postdoctoral researcher working with the Forest Service Eastern Forest Environmental Threat Assessment Center and the study’s lead author. Researchers used the Water Supply Stress Index model developed by Eastern Threat Center scientists to simulate changes in water and carbon cycles on 170 U.S. national forests and grasslands based on projections from 20 global climate models. Even though climate models project higher levels of precipitation in the future, the researchers found that forested watersheds could become drier because forest water use (through evaporation and transpiration) will increase dramatically with higher air temperatures. By 2100, this elevated water use could increase ecosystem productivity – the growth of trees and other plants — by 8 to 24 percent, leading to a projected 4 to 7 percent decrease in water yield. The most severe declines in water yield could be seen in the Northwest, West North Central, and Southwest regions of the United States. Read the full text of the article online.